From time to time I read lawyerly things such as thick leather bound books with language most English speakers don’t understand (had to include an Anchorman reference), and intellectual property specific magazines. While looking through one of those magazines I noticed this advertisement for Xerox. The advertisement is’t for their services, but rather informs people how to use their trademark, in an effort to avoid it becoming generic. Not all trademarks are created equal, they vary in strength and significance. Generally, the more inventive your mark the better, however, when the mark becomes the common name for the product associated with it, the mark may suffer genericide (non-legal term). This means that when a mark becomes the genus or common name for a product such as “escalator” for moving steps, or “thermos” for a flask/water bottle (other generic marks), that mark no longer enjoys trademark protection. Sometimes this genericide takes the form of the mark being used as a noun or verb. Many famous brands are facing this problem, such as “google” for searching the internet or “xerox” for making copies. Have you ever heard someone say “let me google that” or “I’ll go xerox that”? To stave off a mark becoming generic owners of the mark must go the offensive. The Xerox advertisement is a perfect example of this. 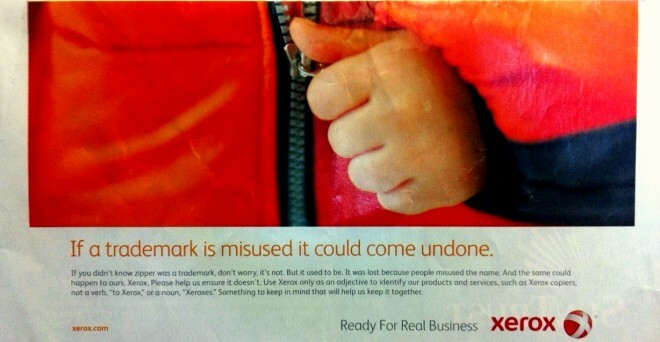 Namely, in their ad they ask people to use “Xerox” as and adjective instead of verb or noun.